The Huffington Post reported on Wednesday; Hundreds of dead sea birds and sea lions washing up on beaches in California, America. Since April, dying marine animals and birds have been washing up en masse on the shores of Southern California’s beaches. The Ventura County Star reported that dozens of sick or dead sea lions had been spotted in Ventura and Santa Barbara counties. Several other dying or dead animals, including loons, pelicans and even dolphins had also been found. Elaine Ibarra, who works with the Santa Barbara Wildlife Care Network, told CBS Los Angeles that hundreds of seabirds, including pelicans and loons, have died in Southern California in recent weeks. It’s the worst seabird die-off in the area that she’s ever seen, she said. 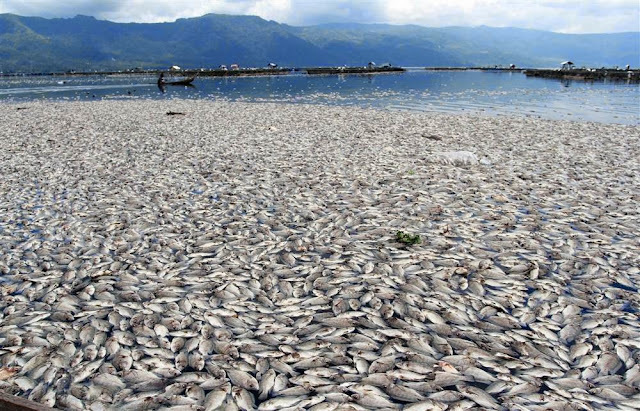 Also on Wednesday Perth Now reported: Tens of thousands of fish suddenly die in a river near Mandurah, Australia. THE sudden deaths of tens of thousands of fish have sparked environmental and health fears around the Murray River near Mandurah. The Department of Water started running tests last week after reports of fish washing up between the Pinjarra Road bridge and the river mouth. Bream, mulloway and whiting were some of the prized species identified among the dead in North and South Yunderup. 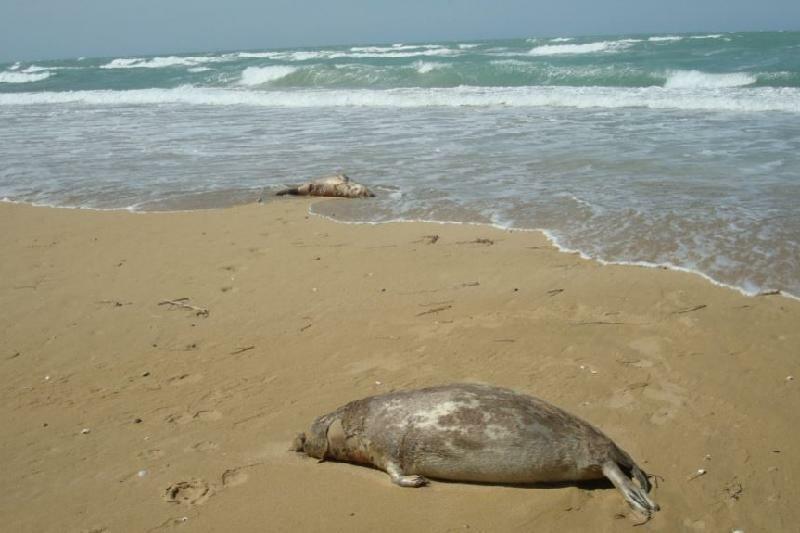 This week Kazinform reported; 243 dead seals have washed up dead in the Caspian Sea during the past 2 months. Dead seals on the beaches of the Caspian Sea. On Tuesday NDTV reported; Tens of thousands of fish are dying in lakes in Hyderabad, India. Two lakes In Hyderabad - Shamirpet and Medchal - were found packed with 60,000 dead fish, according to officials who handled their removal, untreated sewage, industrial and agricultural chemicals, have caused the lakes to lose oxygen, they claim. Also on Tuesday the Trinidad Express reported: Large amounts of dead fish washing ashore in La Brea, Trinidad and Tobago. ACTIVIST group Fishermen and Friends of the Sea (FFOS) says it has found at least 16 species of fish washed up on the beaches La Brea. The group is calling for proper investigations to be conducted on what they are claiming as “daily fish kills” and believes that residual chemicals used in the 2013 Petrotrin oil spill clean-up continues to pose a threat to the south western peninsula. On Monday RTL reported: 18,000 dead fish found in a river in Friborg, France. About 18'000 dead fish have been discovered in the city of Friborg in the Sarine. It is a small silver fish. This hecatomb could be due to the production of electricity. Examinations at the Berne veterinary clinic showed that the blood vessels of the fish were dilated, that the heart had expanded and that they were essentially males, said Jean-Daniel Wicky, Fisheries Inspector Cantonal forests and wildlife. On Monday Critica reported: Large numbers of dead sardines found 'due to red tide' in port El Agallito, Panama. Large numbers of dead fish, mainly the sardine known as Gallota, were found dead at the mouth of the La Villa river, in the port area of ​​El Agallito de Chitré. According to the regional director of the Aquatic Resources Authority of Panama (ARAP), the mortality of the species was due to the presence of the phenomenon known as the red tide, which has been reported for three weeks on the coasts of Coclé and in The area of ​​Pedasí. And this week Vietnamnet reported: Thousands of lobsters are dying in Phu Yen Province, Vietnam. According to vice director of the Song Cau District's Animal Husbandry Department, Nguyen Huu Dai, the lobster death was caused by a sudden weather change when there was heavy rains after a long heat wave. "The rains suddenly changed the saline level and caused a lack of oxygen in water," Dai said. "Another reason is that lobsters are densely raised which resulted in water pollution."